Will you be attending the Bilingual Job Fair Canada this year in Mississauga? If so, be sure to stop by our BlueSky Personnel Solutions booth and meet our president, Julie Labrie. This is your chance to ask her questions, and to share your job aspirations. 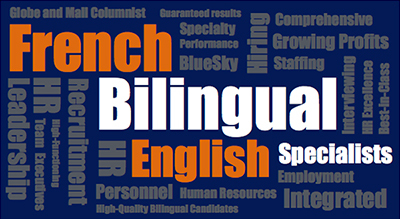 Leverage your bilingual skills and land your dream job! PS: Be the first to know! If you’d like to get email notifications from us with alerts on our latest job postings, sign up here today.